Peggy and Ed did a bad, bad thing in FARGO’s second season premiere. After Peggy (played by Kirsten Dunst) accidentally hit Rye Gerhardt — who had just gone on a murder spree — with her car. 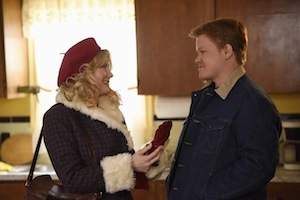 And after she dragged Rye’s body home (and tried to ignore what happened), Peggy’s husband, Ed (played by Jesse Plemons), was forced to finish the job to protect them. Ted Danson has become one of the busiest men on TV, as he appeared in the CSI series finale TV movie, moved over to the crime drama’s latest spinoff, CSI: CYBER, and has a starring role on FX’s FARGO. 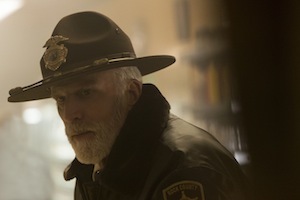 Danson acknowledged he had his own doubts about adapting the 1996 FARGO film into a TV series before he watched the Noah Hawley created series. The first full-length FARGO season 2 trailer is here! It’s 1979 in Sioux Falls, and season 2 is diving into the incident that was referenced by Lou Solverson (who was played by Keith Carradine) in season 1. Lou will be portrayed by Patrick Wilson in this limited series, and he’s joined by fellow FARGO newbies Kirsten Dunst, Jesse Plemons, Ted Danson, Nick Offerman, Jean Smart, Jeffrey Donovan, Kieran Culkin, and Nick Offerman.